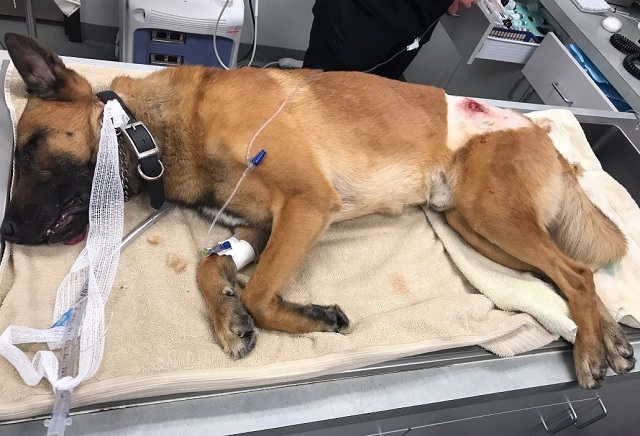 JUPITER, Florida - A Palm Beach County Sheriff's Office K-9 is recovering after he suffered a gunshot wound that was meant for his handler. Just after 4 a.m., Sheriff's deputies responded to Duggans Pub in West Palm Beach, Florida regarding a robbery. The suspect then fled the scene and a short pursuit ensued but the robbery suspect crashed and overturned in nearby Jupiter, Florida. The suspect, later identified as 46-year-old Phillip Oshea, then started firing at three deputies who returned fire. Oshea was killed during the shootout and the three deputies were unharmed. However, a police dog named 'Casper' was shot while protecting his handler. Casper is currently recovering and in stable condition. According to the Palm Beach County Sheriff's Office, Oshea had a warrant out for his arrest for armed in North Carolina and an extensive criminal history.